Mid-century styling brings beauty to the table. Modern S-curves in 3 gorgeous coverings sits above an architectural base. 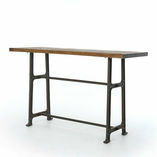 Atomic iron lines support a brass-clad tabletop framed in sandy oak. Woodblock details accentuate a dramatically-angled industrial base. 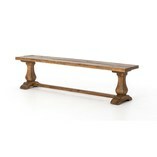 Atomic iron legs support a rounded tabletop of English brown oak. Woodblock details accentuate a dramatically-angled, industrial base of rustic black iron. Slim lines and mixed materials combine for ample comfort. Architecturally inspired steel tubing is graced by simply contoured seating. Thin slabs of American walnut, peroba, and cruzeta wood are layered into brickwork mosaic panels that seem to float within airy, iron supports. 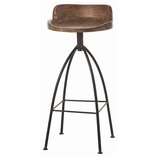 Like our favorite Tyler Bar Stool but perfect for lower counters. Available in Chaps Ebony black top-grain leather. 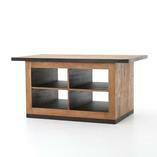 Bar seating is styled with an angular burnt oak frame, a deep seat, and a striking, low-slung back. Covered in an invitingly neutral white-grey or ebony black top-grain leather. Our Turner dining chairs feature soft, ample seating, a peek-a-boo back and natural wood grain metal legs. Available in white or black. Large French-farmhouse style china cabinet with adjustable shelves. 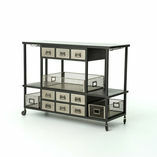 Features plenty of storage space behind large glass doors with a metal overlay. The Verona Chair from our seating features detailed latticework on the front and back of the chair. 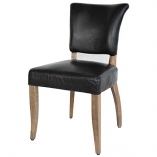 This chair’s simple shape and solid oak legs is perfect for both casual and formal dining. Classic linen dining chair with ample comfort and utilization. Length: 19" Depth: 23" Height: 35" Linen, Belgium wrinkle - white Seat height 20"
CORNWALL EXTENSION DINING TABLE 55/71"
Counter stool with solid pressed oak backrest and leather upholstered cushion seat.Available in Jin and Umber leather97" x 40" x 45"
Dining chair with solid surface shell seat. 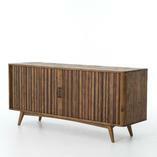 Legs are made from solid fumed oak. Only available in white shell. Dimensions: 81.5" x 51" x 51"
MANHATTAN RECTANGLE DINING TABLE - 72"
Length: 17" Depth: 23" Height: 44"
Weathered oak frame with crossed back in a grey wash finish and cushion seat with rattan cover. 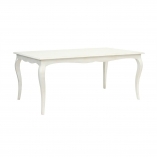 Length: 20"Depth: 20"Height: 44"